BUSTED FOR SMOKING POT!! What? Seriously. Who didn't like Mary Ann? I would take a three hour cruise with her, she seemed so nice and stuff. But OH the HORROR! The 69 year old got caught with marijuana, and now is serving six months probabtion, which isn't really that bad in and of itself, but still.. get your name smeared all over the front page of cnn.com doesn't do much for one's reputation. GIVE ME A BREAK! Somehow, drinking your face off is legal but partaking in a little of the 'erb isn't. Or is it just the american's favourite facination with dissin' celebrities on every chance they can? Even 69 year old celebs like Dawn Wells? Yikes I say.. yikes. haha.. call me ignorant but I had NO idea who Dawn Wells was until I read your post. Be careful! So many people think the "media" is the voice of the average american. The truth is that this story might appeal to only 10% of the population, and most of them living in hollywood obsessed california and new york. 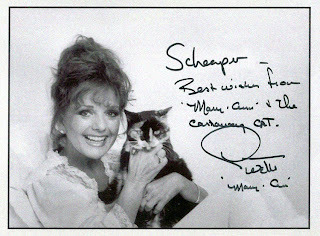 They love their celebrities and hate them at the same time... that's NOT mainstream america, that's "media america"
Dawn Wells is like my 2nd mother. I spent a lot of time with her when I was working as a french poodle breeder in Beverly Hills in the early 90's (which is where I got the picture) during the discovery phase of my life. Yea, the good old days. Anyway, I make the distinction of mainstream america to be synonomous to media america based on two facts; In canada, there is no distinction between media and mainstream AND.. the press is into making money, how do make money? Choose topics that appeal to the mainstream. Sorry man.. Americans have a hard on for dissin the celeb.. big time. Alex, you're absolutely right on about that. I just used the wrong word. American's do love celebrity gossip and MOST media is a money making business. But i'm telling you, there is a MAJOR devide between hollywood america (media america) and heartland america. (there I THINK I used the right word now, heartland, not mainstream, and I might even call it "middle america") All i'm saying is that the mainstream media will report on what they think their demographic will want to hear AND at the same time they shape them. And I call that demographic "media america" AKA most californians and new yorkers. As a canadian living in the states I see this first hand. In highschool I was 60% sure of this theory, now I'm 100%. I came... I witnessed. Here's an example of the devide; I looked more into that story, I found it on the CNN homepage, the MSNBC homepage, and CBS. I did NOT find it on FOX news, fox news tries harder to appeal to more of the middle americans, but i'm leary of them too because they're in it for the money, they're all corrupt in their own way. Hollywood and the big four do nothing for me. So yeah I agree, It's a crappy story that doesn't appeal to me or anyone I know, i'll stick to the news outlets that do. Don' get me started on the media in America, or media anywhere for that matter. Anecdotal evidence aside, the media is out to make a buck but they also have an Agenda that is as vicious as it is pronounced if we open our eyes a bit. They can make a buck on stories like this because it appeals to our baser instincts. However, lets not kid ourselves that this is an American phenomenon. Why do you think those same papers, websites and television stations reach Canada as well? There is an audience for this crap everywhere. Not to be too much of a devil's advocate but we are here in Calgary talking about this story. And I heard about it on the local radio station. Oh, Alex, you will like this too. From what I heard, she initially told the officer that she picked up three hitchhikers and then kicked them out when she learned that what they were smoking was weed. Although I find it a bit humorous and no big deal, it is a little tragic to me at least that such an icon could come to such a pass.